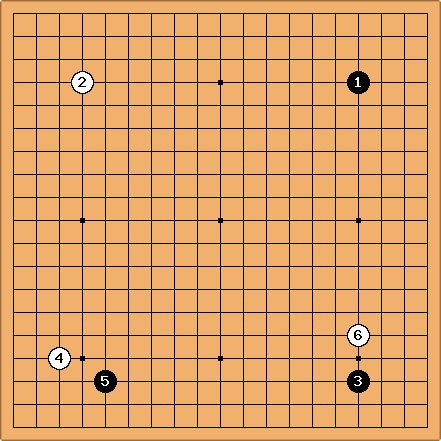 As ideas in joseki, these applications of the attach-crosscut shape are marginal patterns but with some interesting concepts and tactics connected to them. 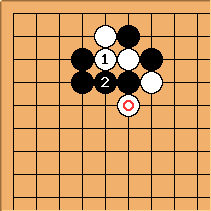 For example this is a normal modern opening (see preventing the formation of the Chinese opening). 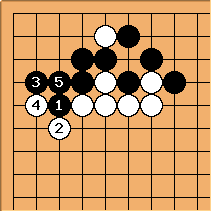 Black may well play out the common joseki given here in the right-hand corner. 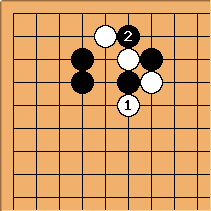 That leaves giving indirect support to : White can't hope for a very good result playing on the lower side, because is a low stone in a solid group. Later, and are a theoretical way to play here. 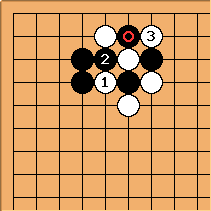 If a pincer isn't good, because of , why not try to make Black overconcentrated here? is a sacrifice to do that. 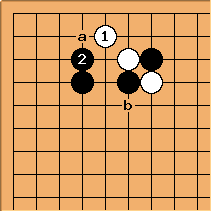 Bill: As noted below, the sequence given has been tried by top Korean pros. However, a GoBase search gives 'a' as the most frequent local response for White, with 'b' - 'f' as other alternatives. Also, 'g' shows up more often than . And it is usual for both sides to tenuki. 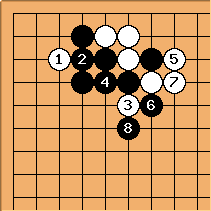 With a 6 space gap between the Black positions, it is not clear that Black becomes overconcentrated in this variation. 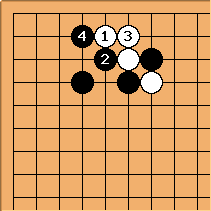 These are standard plays, with White adding one stone and sacrificing both. Clearly the timing before is correct to make the most of the sacrifice. 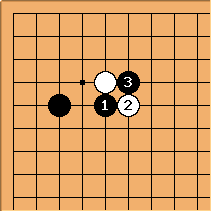 This finishes off the sequence - White probably makes a flanking extension to a big point on the left side now. The judgement of this result has to be based on the overlap in influence between Black's group to the left - now unquestionably thick - and . 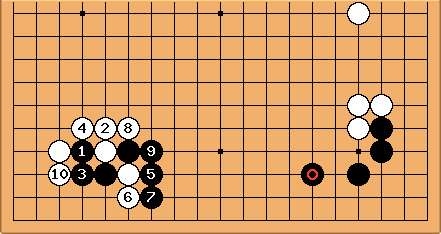 Sequences like this have been tried by top Korean pros. 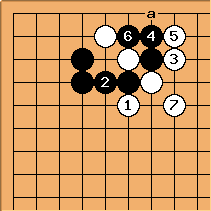 For the corresponding 4-4 point joseki, the strategic meaning is nearly the same. 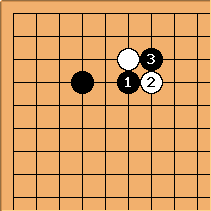 Black will play for a good reason, probably that White is already strong on the top side. 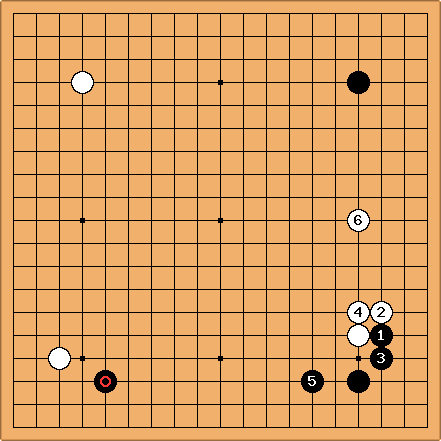 In reply to , is an old move of Go Seigen that has been seen often since 1990. Now White a or b. Suppose to leave a cutting point in the corner, up to is normal and White needs to add a stone: so that Black ends in sente. 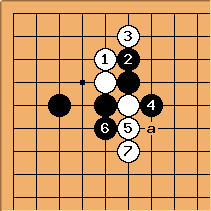 Assuming this result, Black ought only to start the joseki if White's strength now overlaps with the upper right. 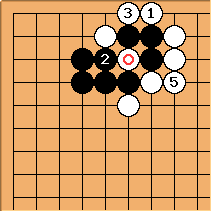 If with the idea of giving Black an empty triangle, is tesuji. In fact this line occurred mostly in problem books rather than high-level games, until recently. The reason is that if captures we get and White can only get any sort of result here with which is a massive ko fight. Top pros have indeed got involved with this, though. So what about the empty triangle? 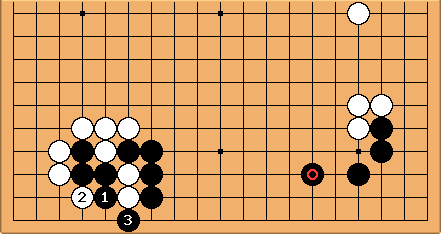 How will White continue? Like this? 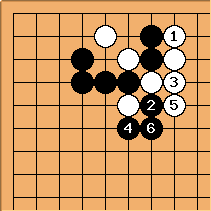 Bill: Suzuki and Kitani's Small Joseki Dictionary gives the variation in the above two diagrams, judging it as an even exchange. 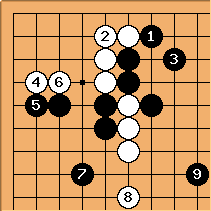 If instead it's here, Black plays since the triangle is now filled. White can look forward only to a small life here, and perhaps now doesn't seem a good idea. 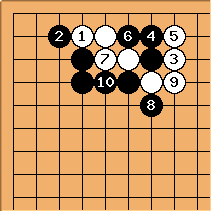 unkx80: The following appears to be another joseki. This line is sometimes seen in amateur and professional play. 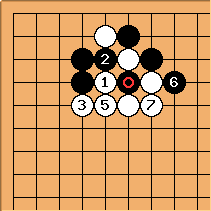 If there are nearby White stones towards the right side, this line of play aims to make White overconcentrated. and (note their order) turns Black into a dumpling before capturing at . The stone leaves some aji in the corner. There is also this complex variation. It is not seen that often in pro play, though it does occur occasionally in high-level games. The joseki dictionaries aren't a safe guide (that includes Ishida, 2nd edition in Japanese) since there it isn't at all clear that the main line given is from pro play. 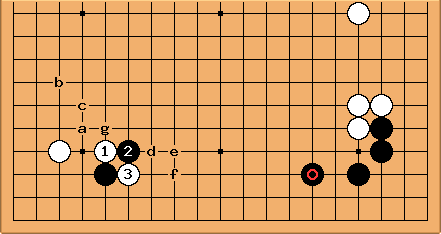 After here, Yi Ch'ang-ho has played , rather than at a as in the 'book' (game 1991-06-0 against Yu Ch'ang-hyeok, colours reversed), and this was also seen earlier in Japan. These plays followed, as part of Black's plan to build up a central framework.